Frequently, we are building PPC search campaigns pointing to many different URLs. How cool would it be to be able to check our dataset for 404 pages BEFORE we upload to AdWords, to Bing, or to Sklik? Read more to find out! Situation: You just build your search campaign for an e-shop. Your final URLs point to hundreds and hundreds of pages. 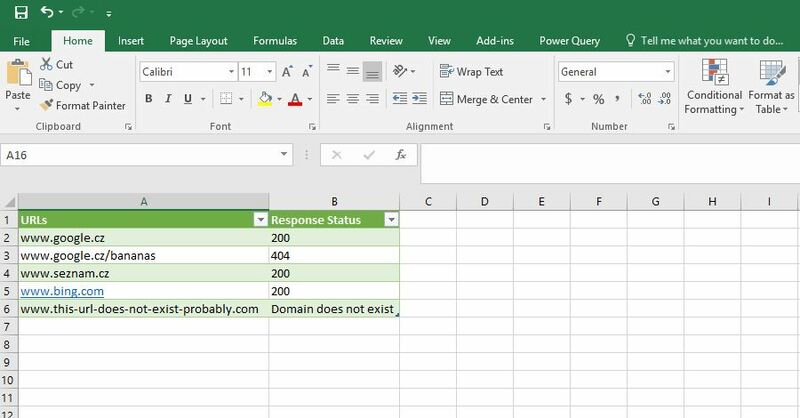 You don’t know if you made an error in the URL structure so you would like to check your KWs for 404 errors directly in Power Query. 404=Bad luck! Page does not exist. Domain does not exist = Really? Are you working on the correct project? Of course, this little tool can be worked into every campaign build up as one of many related steps, this standalone sample is just to show one of the many things Power Query can do for you pretty effortlessly. Navigate to green table>right click>Refresh. This will trigger refresh of “Values To Check” query. Confirm all prompts, set all permissions to “anonymous” or to “public” (if asked). Wait a little. The more URLs you have, the more time it will take. Generally speaking, 100 URLs should be checked in 30 seconds. Can you please share the link which works fine? you need to click the download arrow in the upper right corner on the after you click that link. Then it will get downloaded. Seems like this is a great tool, but I can’t get the “Query – Values to Check” connection to refresh. I get an error saying: “Initialization of the data source failed. I’m an occasional Excel user, so I’m not sure how to troubleshoot this.